It’s getting close to Christmas and all the shops have got their Christmas decorations out. 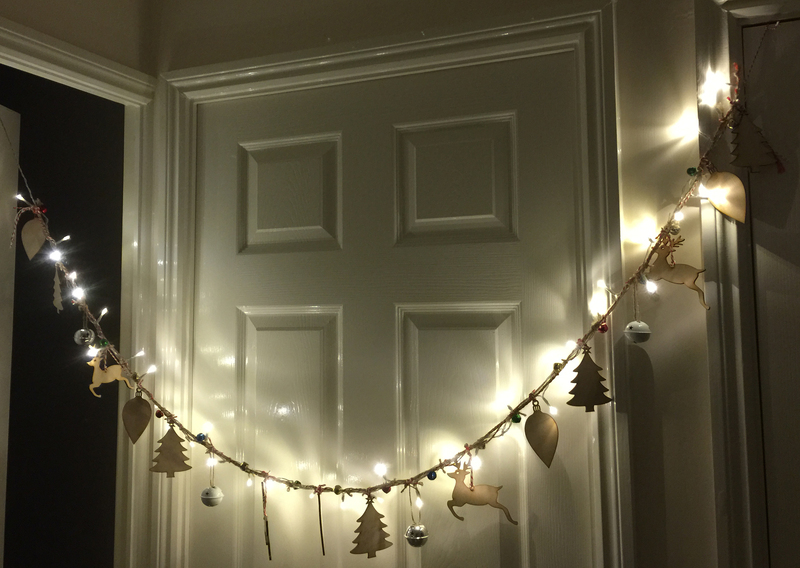 You might have noticed some beautiful and rather expensive light garlands that have become all the rage over the last few years. 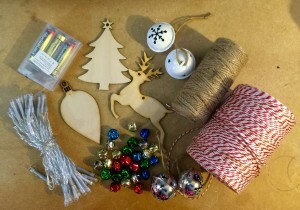 Here I will show you how you can quite easily pull together your own Christmas light Garland like the one on the left. I hope you enjoy making your garlands. covered bells in silver and/or white. 15-20 medium coloured metal bells. 6mm Jute string – approx. 6 metres. 6mm christmas style butcher’s string – approx. 6 metres. 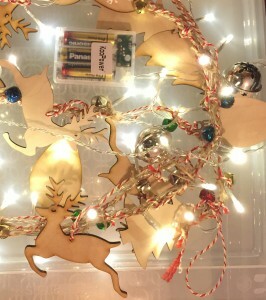 One set of LED Christmas lights approx. 4 metres, with 80 bulbs and preferably battery operated. Approx. 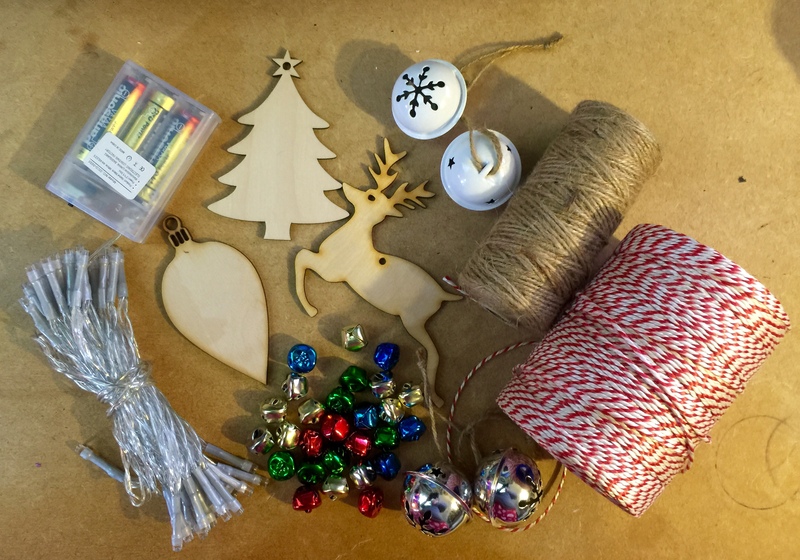 15 Christmas wooden shapes – I used three different types, but you could use more or less. Cut three lengths of the Jute string approximately 2 metres long. Knot the three lengths together at one end leaving about 5 cm of string above the knot and plait together. You could also substitute one of the lengths for butcher’s string for a different effect. Leave about 5 cm of string free at the end of the plait and knot the lengths together - you should have around 1 – 1.5 metre plait length. Attach the light furthest away from the battery pack to the beginning of the plait using the 5 cm of free string. Weave the plait over and around the lights. At the end of the plait tie the closest light to the end and then turn the lights, tie down the first light after the turn half way between the next two lights. Weave the rest of the lights in and out of the plait and lights so that they are evenly spaced and you have lights on both sides of the plait. Tie the final light to the plait using the free string at the end. Using the jute string attach one of the small coloured bells aroud every second light. In the lights without bells proceed to knot your shapes and the larger bells in sequential order. You’ve now got your very own Christmas lights garland! For extra colour why not incorporate some ribbons or faux berries and holly. This entry was posted in Christmas Crafts, Crafts, My Art and tagged Christmas, christmas crafts, christmas decorations, christmas garland, Christmas Lights, craft, craft project, craft tutorial, crafts, decoration, decorations, decorative lights, handmade, handmade decorations, ruth weal, ruthweal, wealie, wealie arts, x-mas, x-mas decorations, x-mas garland, x-mas lights. Bookmark the permalink.